David says living in Anchorage is a weird combination of familiar…..and not. I say – EXACTLY! And we’re not even talking about mountains and moose. But that too. 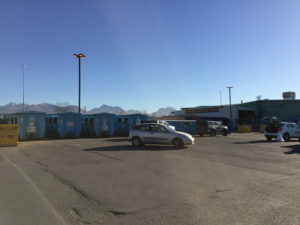 I snapped this picture at the recycling center yesterday, because….mountains. I didn’t give much time to framing the picture. It’s not particularly good, but I captured it because of the mountains. The thing is, I hate going to the recycling center. It’s a sorting chore that exasperates my brain and I put it off for as long as I can stand the clutter of cardboard and bottles and milk jugs and paper accumulating in the little outside room that leads to our fire escape. When the piles start falling into the walkway it’s time to go. Preferably that happens on a clear sky – not (literally) freezing cold – day. When we first moved up here in the fall of 2012 there was no curbside recycling for homes in downtown Anchorage. When I called to set up our P Street utilities, Waste Management told me they were planning to implement curbside recycling later in the fall, but until then I’d have to take stuff to the recycling center myself. Later that fall we received a note with our bill stating that curbside recycling was postponed till spring. Cue #alaskatime. In the fall of 2014 we got an extensive pamphlet from Waste Management about the dos and don’ts of commingling in our soon coming recycling bin. Shortly after the bin was delivered and WOOT! what delight – tossing our recycling in the bin to simply drag curbside every other week. The joy was short lived. A few weeks later we learned we’d be moving back to Oregon before the end of the year. Back to Oregon where we can recycle nearly everything with easy convenience. We returned to Anchorage 13 months later – in January 2016 we moved to an apartment building downtown. The building’s commercial zoning means I’m back to watching the weather for the most pleasant days to sort paper, cardboard, bottles and milk jugs into great blue dumpsters at the recycling center. With mountains in the background. I made a couple additional stops after recycling yesterday and then swung by our downtown elementary school to get Ethan at the 3:30 bell. But a couple minutes before students were to run out the back door and flood the school yard where I stood waiting, an announcement came over the intercom: Parents – we are releasing all students out the front door. There is a big bull moose inside the fence, on school grounds. The message repeated several times as parents abandoned routine and moved to meet their kids at the front of the building. When the bell rang, Ethan came out the front door, green backpack slung over his shoulder and a wide smile across his face. There was a buzz of excitement as kids and parents exchanged knowledge of the moose. 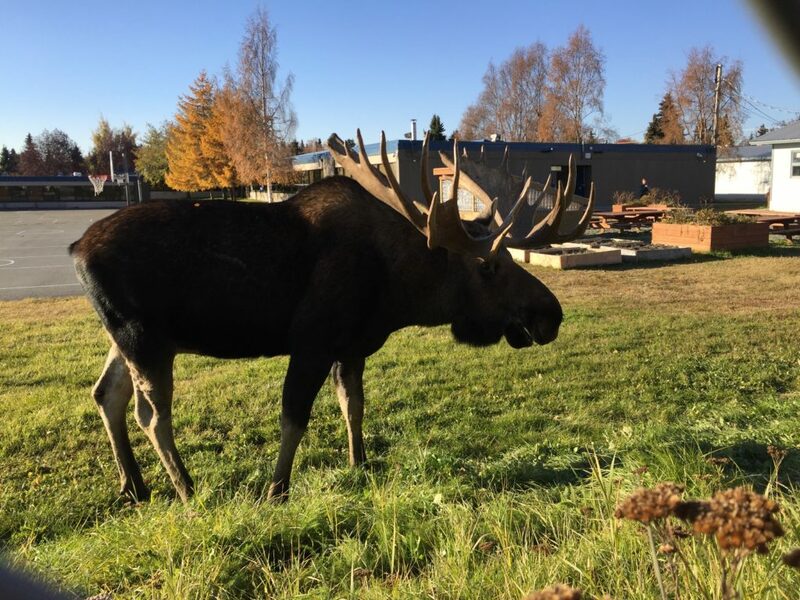 Many of us walked to the side of the building where we quickly spotted this great big guy ambling along inside the fenced perimeter of the schoolyard, munching grass and snacking on trees. 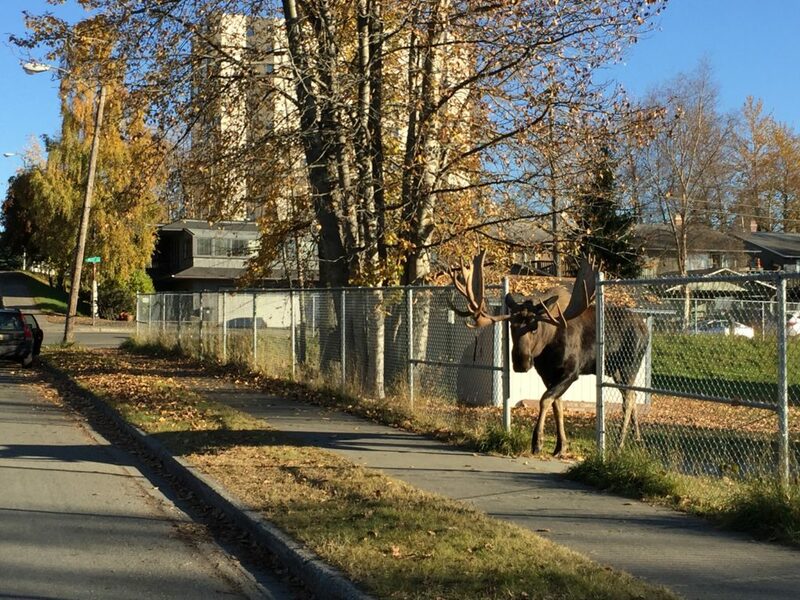 School staff diligently kept people out of the schoolyard on all sides as the huge moose took his time wandering about completely unperturbed by the all the people watching and waiting. 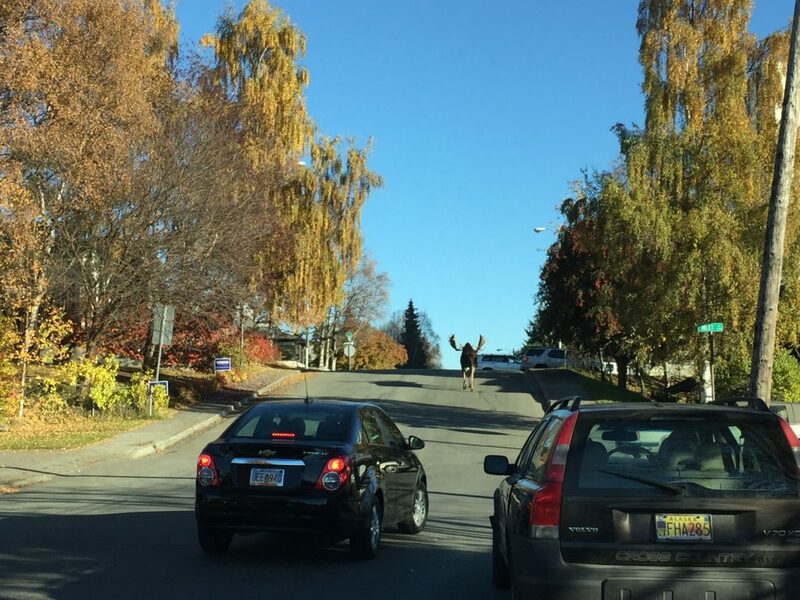 Within the half hour students and parents had mostly cleared the area and the moose found the exit and nonchalantly turned up the hill. We continued to watch as he took his time crossing busy L Street while drivers stopped and waited. From there he continued his grazing walk through the neighborhood. We went home. This morning a friend asked me if moose are a normal part of life here (so common we don’t care) or if seeing them is a “special” moment. It’s a good question. And my best answer is: Both. I think this is partly because we really do have to pay attention when we encounter them. Due to their tremendous size and unpredictable nature – when they’re not just all chill, taking a munching stroll through the schoolyard – they can be quite dangerous. Though we see them pretty commonly, we never ignore them. Sometimes they rearrange life – a race, or a hike, or a school yard routine. They get hit by cars and people die. And even if they’re simply hanging out, posing no imminent threat, their presence is a reminder that in spite of our schools and cable TV and stores and dentists (and roller rinks? ), we really do live at the edge of wilderness. I call it #alaskamagic. Moose walk right here among us: wild, dangerous, and beautiful. In the commonness of our daily living, there is a magnificent, beautiful call to look up. To look further. And to breathe in the wonder.